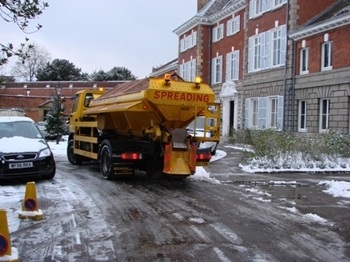 Our winter gritting service ensures that, where reasonably practical, main roads are kept clear of snow and ice and entrances to important public buildings remain accessible. We use precautionary gritting from October to April to prevent the build up of ice on selected roads. View a list of secondary roads cleared in extreme conditions. Our Winter Service Plan (pdf, 990KB) sets out in detail how we will respond to snow and freezing weather conditions. If you have any feedback on our Winter Service Plan, email highwayoperationsandstreetscene@richmond.gov.uk. Please note we are unable to respond to queries about road gritting sent to this email address. We sell grit bins which are ideal for community groups, schools and large organisations, but can be requested by anyone. The bins are delivered full of grit, and come with a shovel and a lockable lid. Each request for a grit bin is assessed for suitability, as the bin will need to sit on your property but adjacent to a public highway.